2007. Looking North, River at 292. Between 1890 and 1901 the Mill Stream became blocked for 50 metres at its separation from the river. 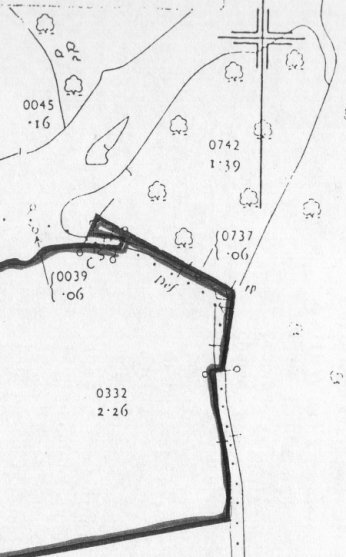 This blockage (thought to be artificial) stopped regular flow along the Mill Stream, which by 2000 was rapidly changing into an overgrown ditch. 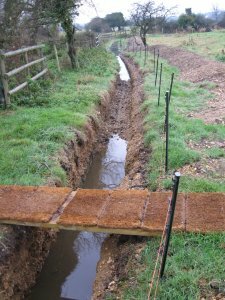 Since 2007, the damage caused by the original blockage has been repaired, by excavating and deepening the old channel. There is now good flow from the river down the Mill Stream for river heights of over 250, regularly seen between November and March. 2007. Looking South, River at 292. 1840. 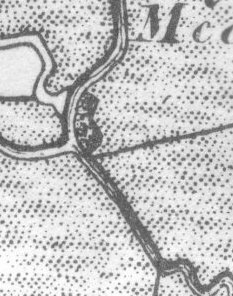 Corfe Mullen Tithe map. 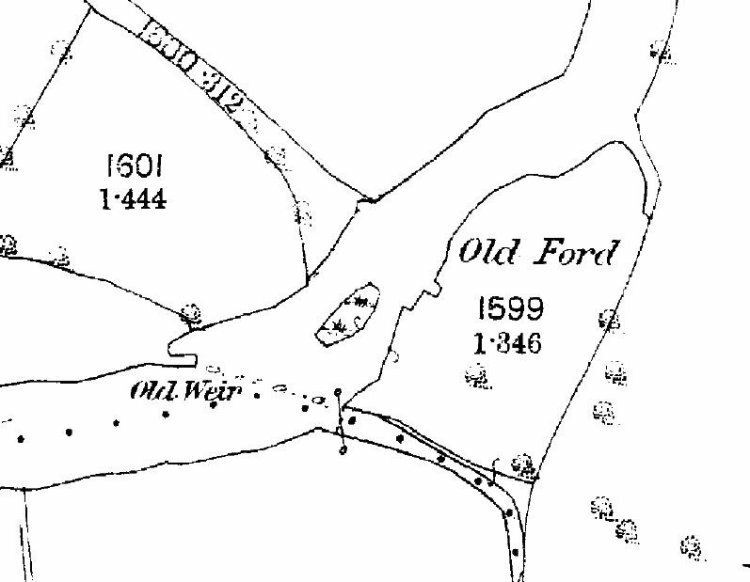 Sometime between 1888 and 1901 the full-flowing Mill Stream was filled in (and ceased flowing) over a distance of about 50 metres near the point of joining with the Stour. The Old Weir was needed to divert low summer flow down the Mill Stream to drive Lake Mill near Lake Gates roundabout. The weir vanished before 1901. Weir Lane (still existing) once connected Poplar Farm with the Weir and the Old Ford allowed crossing of the Stour onto Eye Mead. The Lane is now used to connect Eyebridge with Poplar Farm as part of a popular walk on National Trust land. 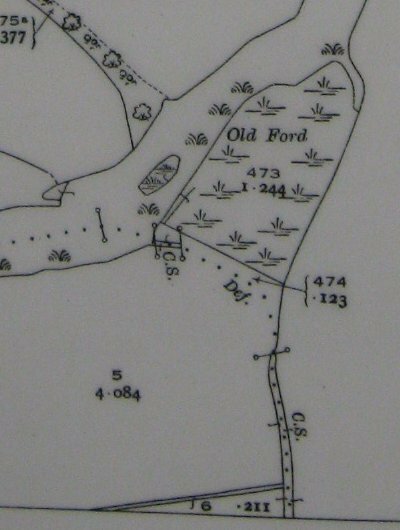 The present concrete bridge over the Mill Stream (connecting Bear Mead with Eyemead) first appears on a 1954 map. Abbreviation "C.S." means "Centre Stream", referring to the line taken by the parish boundary along the Mill Stream. "Def." 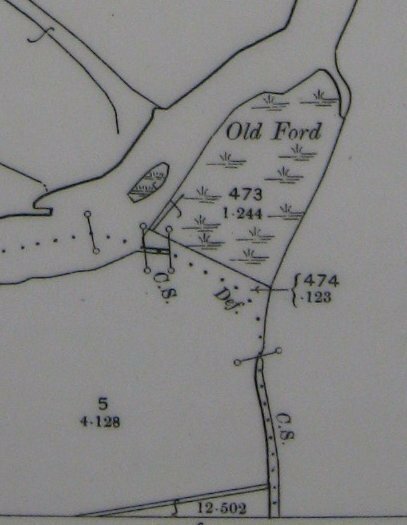 means "defaced", referring to loss of boundary information caused by the filling in of the Mill Stream. 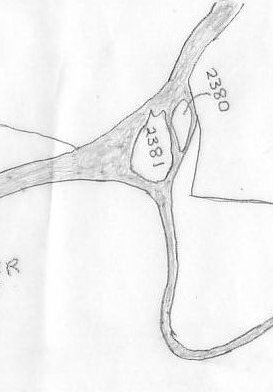 Surveying for the 1901 O.S. may have been done around 1880, so the filling-in may have been carried out about 1890. 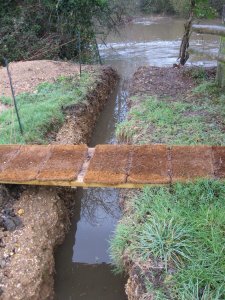 This may have been to prevent flooding of the old road, where the present elevated Julians Road passes close to the Mill Stream, just North of Lake Gates roundabout. The blockage is now unnecessary to keep Julians Road dry. 1901. Ordnance Survey map 25 inch. 1928. Ordnance Survey map 25 inch. 2002. 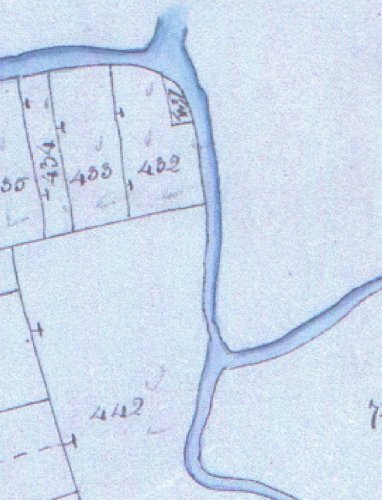 Map with deeds on purchase of land. Willow Wood in Bear Mead on River Stour. 1 mile upstream of Wimborne in Dorset. Scale 1:2,500. Date 1888-1889. Compiled, formatted, hyperlinked, encoded, and copyright © 2009, John Palmer, All Rights Reserved.